The Shins will play their first UK show in over four years and their only UK festival in 2016 at this year’s End Of The Road. This will also be their first ever appearance at the festival. With a new album potentially in the pipeline, we are delighted to welcome James Mercer and his band of merry melancholy men to Larmer Tree Gardens for the first time. They will open the festival with a special Thursday night Woods Stage headline performance. Further additions to the line up include Faris Badwan and Rachel Zeffira’s orchestral pop side project Cat’s Eyes, whose anticipated new album is due next month. More new talent has also been added in the shape of Virginia based singer-songwriter Lucy Dacus whose debut album No Burden is already one of the year’s most acclaimed, as well as some-time Angel Olsen backing band members LionLimb with their baroque pop ballads. We are also delighted to announce the winners of our Play End Of The Road competition. First up, London based purveyors of drone-pop The Leaf Library, who describe themselves wonderfully as “Yo La Talk Talk”. The second lucky newcomers are the dreamy psych poppers Baywaves, whose forthcoming album was produced by Joe Walker of fellow EOTR 2016 performers King Gizzard & The Lizard Wizard. Playing her only UK festival since the release of Divers, one of the albums of 2015, the dazzlingly talented Joanna Newsom will headline End of The Road with her harp-led sonic odyssey. Joining Joanna as headliner and making their first ever appearance at End of The Road will be the Technicolor, genre-hopping, experimental vocal harmonizing one offs Animal Collective. 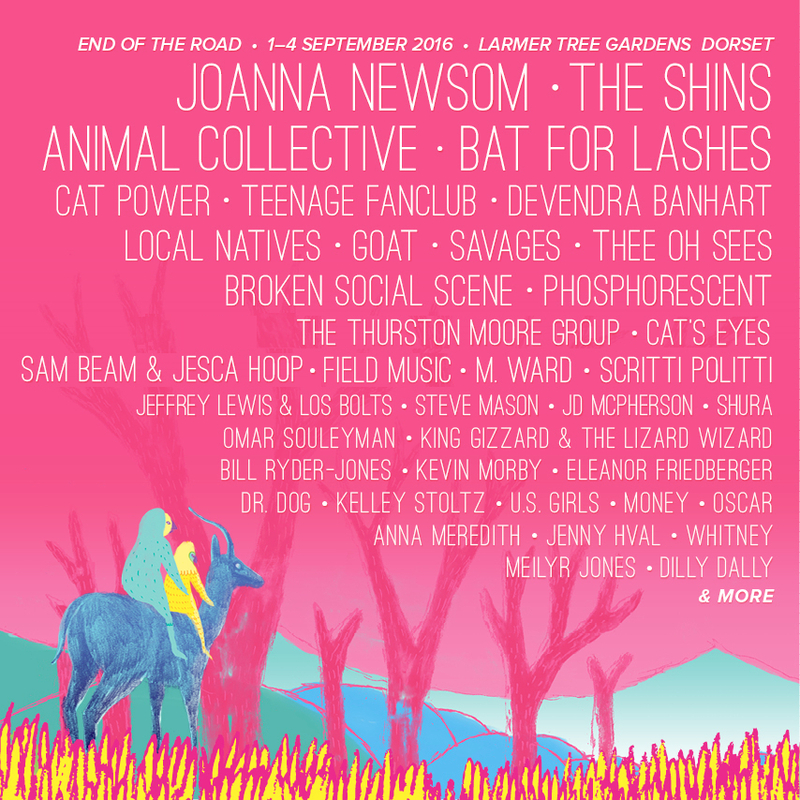 We are also delighted to welcome Bat for Lashes to End of The Road for the first time, who has long been on the festival wish list with her unique brand of otherworldly pop. View the full line up here. We are thrilled to announce this year’s Comedy Stage. Joining Stewart Lee on the bill we have a mixture of stand ups, sketch, character, musical comedy and political satire in store for 2016. First up, acclaimed comedian and columnist Bridget Christie. Having won more awards than you can shake a biro at, Christie is a familiar name to many and for good reason. Her breakout show A Bic for Her and follow-up Ungrateful Woman were critically-acclaimed – leading to sold out shows across the country. Her series Bridget Christie Minds the Gap has just completed a successful second run on Radio 4. Joining Christie is festival favourite Josie Long, who will bring her unique brand of surreal political satire to this year’s comedy line up. Fresh from the launch of her new Radio 4 sitcom Romance And Adventure, about a woman moving to Glasgow and trying to make friends, Long makes a long awaited return. As if that wasn’t enough, the inimitable ‘satirist for hire’ Andy Zaltzman will bring his Political Animal show to the festival, including his usual array of guest speakers. Fellow Radio 4 regular and TV writer John Finnemore is best known for airline-based Radio 4 sitcom Cabin Pressure starring Benedict Cumberbatch, radio sketch show John Finnemore’s Souvenir Programme, and frequent stand out performances on The Now Show. The comedian will make his debut at the festival with a very special Sunday night featuring an equally special guest. Other highlights include the legendary comedian and Comedy Club host Arthur Smith, along with comedy writer turned celebrity Masterchef Hardeep Singh Kohli who makes his first appearance at the festival. Hugely respected amongst comics, and wildly popular, Adam Bloom brings his super-high energy delivery and frenetic approach to nailing an unfathomably high laugh count provides an exhilarating experience for both Bloom and audiences alike. We are also delighted to welcome back Knightmare Live: The Festival Expansion Pack, the over-the-top and very funny stage adaption of the cult kids TV series starring Paul Flannery, Tom Bell (who recently played an alien in the new Star Wars) and James Rowland. Following critically-acclaimed Edinburgh Fringe runs, a national tour, and a recent West End debut, join familiar characters like Treguard and Lord Fear in what will no doubt be an even more imaginative and ramshackle late night show. Following this year’s headline announcement, we are delighted to add Scottish genre-defining alternative legends Teenage Fanclub to the 2016 line up. This will be their only UK festival appearance this year. Along with Savages, Broken Social Scene and Thurston Moore, we are also thrilled to welcome the inimitable Stewart Lee to the festival for the first time, who will headline the comedy stage. We’re also very pleased to welcome back rising star and ex-Woods man Kevin Morby, one of last year’s highlights and sure to release one of the albums of 2016 with Singing Saw. Chicagoans and the band on everyone’s lips Whitney will also be joining this year’s line up with their hazy country folk melodies, along with a very special performance from Sam Beam & Jesca Hoop’s collaboration Love Letter For Fire. Other additions include sonic adventurer Anna Meredith whose excellent debut album Varmints is fast becoming one of the critics’ favourites and Jenny Hval who will bring her captivating brand of experimental performance art pop from one of last year’s most acclaimed albums Apocalypse, Girl. We are thrilled to announce our 2016 headliners. Playing her only UK festival since the release of Divers, one of the albums of 2015, the dazzlingly talented Joanna Newsom will headline End of The Road with her harp-led sonic odyssey. In 2011 she entranced us with a truly magical headline performance, and we’re delighted to have her back to do it all over again. Joining Joanna in a 2016 UK festival exclusive, will be the mercurial and mesmerising singer-songwriter Cat Power. Playing with a full band, Chan Marshall’s famously raw live show is sure to captivate Larmer Tree Gardens. Making their first ever appearance at End of The Road will be the technicolor, genre-hopping, experimental vocal harmonising one offs Animal Collective, who release their eagerly awaited tenth studio album Painting With featuring the likes of John Cale and Colin Stetson, later this month. Also playing End of The Road for the first time, we are very happy to welcome Bat for Lashes who has long been on the festival wish list with her unique brand of otherworldly pop. Fresh from her forays into 70s world psychedelia with Toy and Dan Carey last year, with the electrifying side project SEXWITCH, Natasha Khan is due to return as the much loved Bat with a new album in 2016 and we can’t wait to see what she has in store for us. John Dwyer’s peerless Thee Oh Sees need no introduction. After their acclaimed 2015 album Mutilator Defeated At Last, the San Francisco legends bring their thrilling garage rock to this year’s festival. This year will also feature a rare appearance by masked psychedelic Swedish collective GOAT, set to deliver their signature joyous and intoxicating live show. End of The Road are also excited to welcome the alt-rock shaman Devendra Banhart who will also be playing at End of The Road for the first time. National Express Coach Tickets Now On Sale! Coach tickets are on sale now! National Express are offering an affordable, fuss free way to make it to End of The Road 2016 from various locations across the UK. Head to their website to find out more and to book your ticket now. National Express offer a 25% group discount for groups of 4 or more travelling together under a coach only package. To redeem, simply book four or more tickets from the Journey Planner on this page at least three days before you travel – the discount will be automatically applied to your booking. See routes and prices* below. Journey’s to the festival can be booked for either Thursday 1 or Friday 2 September, with returns departing our site on Monday 5. Unsigned Band Applications Are Now Open! September 2016 will see End of the Road Festival return to Larmer Tree Gardens for its 11th year, and once again we will be running our Play End of the Road Competition – giving new and unsigned bands the change to perform. We’ve always supported and championed new, unsigned acts and our 11th year will be no different. Head here for more information on how to apply. Christmas Shindig Line-Up Announced, Tickets on Sale now! We are thrilled to announce the line up for our annual Christmas Shindig – taking place at Oslo in Hackney, London on Thursday 10 December. We can’t wait to welcome Joanna Gruesome as our festive headliners, especially after the band had to cancel their festival performance earlier this year. Completing the bill are DIY punk heroes Martha (fresh from their US tour with Radiator Hospital) and festival highlight, Yorkshire born anarchic singer-songwriter Mark Wynn. There will also be DJs and a whole lot of dancing until 2AM. Tickets cost £12 + booking fee, and are on sale now. Buy yours here. Oslo is right beside Hackney Central Overground station. Sufjan Stevens, Tame Impala, The War on Drugs, Future Islands, Laura Marling and more are all lined up and ready to go for the 10th Edition of End of The Road Festival. We’ve got some incredible bands set to play across our 4 stages next weekend but with every blessing comes a curse, and there are inevitably going to be some timing clashes. Alas, not to worry, our online media partners The Line of Best Fit are on hand to walk you through the toughest of the weekend’s decisions. Below sits a download link to their handy clashfinder listing the full line-up within a quick glance table – full timings and stages included. Unfortunately, Curtis Harding has just had to cancel his appearance at the festival, so some of the below times may be rejigged depending on his replacement. More when we have it. Human Pyramids are recruiting a choir for their End of The Road performance. Fancy joining them on The Woods Stage? Send an email to humanpyramidseotr@gmail.com to be in with the chance of kick starting Saturday’s festivities. We’ll be drawing 10 lucky names out of the “hat” in advance. Deadline for entry, 28th August. End of The Road 2015 is now SOLD OUT! End of The Road 2015 is now SOLD OUT! A massive thank you to everyone who bought tickets. And of course, you can still get your Campervan/Caravan passes, Car Park passes and contribute to our Festival Wood here. Hoping to camp in style? Check out our Boutique Camping options here. Beginning to plan your travel? The different transport options available can be found here. We can’t wait to see you in September! On top of our musical, comedy and literary bills we’ve also been busy pulling together our cinema schedule and our food stalls.